Take me back 5 years ago and my birthday meant everything to me! It wasn’t just a day, oh no! It was at least a whole weekend if not pushing it out to a week. Well, when you had as many friends as I did you needed to organise a few more dinners to fit everyone one in to celebrate you turning another year older! This year was different though. The two months leading up to my birthday were filled with sadness and loss. My mum got diagnosed with cancer and my husband got made redundant. This all happened a few weeks before Christmas and was a big blow to the emotions and wallet! Over Christmas we had an amazing time and although didn’t go as lavish as we usually would have, still had wonderful food, plenty of drinks and were surrounded by people we love dearly! New year’s came and went and I hurt my neck. So when I was asked by hubby what I would like to do for my birthday I truly had no need or want to do anything. I am a pretty homely body as it is but this year I just didn’t feel like celebrating! Luckily for me I have wonderful friends and family who jeered me up. Walking into my office I found my desk covered in balloons and posters of cakes pined up on my walls! I even had gifts! It is the responsibility of the birthday girl/boy to provide the cake for morning tea. I understand why they do this it’s so no-one’s birthday is forgotten! Being as I am not a baker and hubby isn’t working I thought he may take the roll of making my cake. Alas, no…..he would not make my cake as he was busy working hard in our back yard. 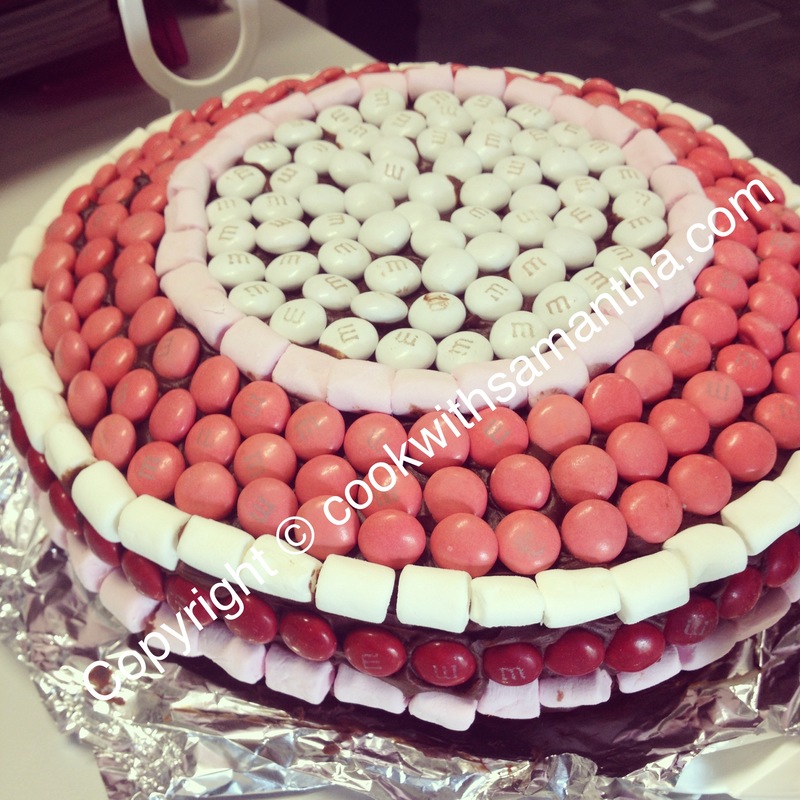 I did opt for a packet mix for the cake base itself but made the icing and decorated it to boot! Needless to say after the chocolate coating covered in marshmallows and raspberry flavoured M’n’M’s and the filling being white chocolate, my colleagues were flying high for a good couple of hours! V decided we had to go for a drink after work so I had luckily planned it with hubby that he would drop me to work and then come back in and be my chauffer. We were tossing up between the Reserve Wine Bar a newish establishment opened up in the Mall of Newcastle or Les Passe Temp, a French inspired bar/restaurant located at the end of Hunter Street. Being as someone we used to work with was behind the opening of the Reserve Wine Bar I decided I should go and check it out! Being as V and hubby were both driving we were taking it easy. 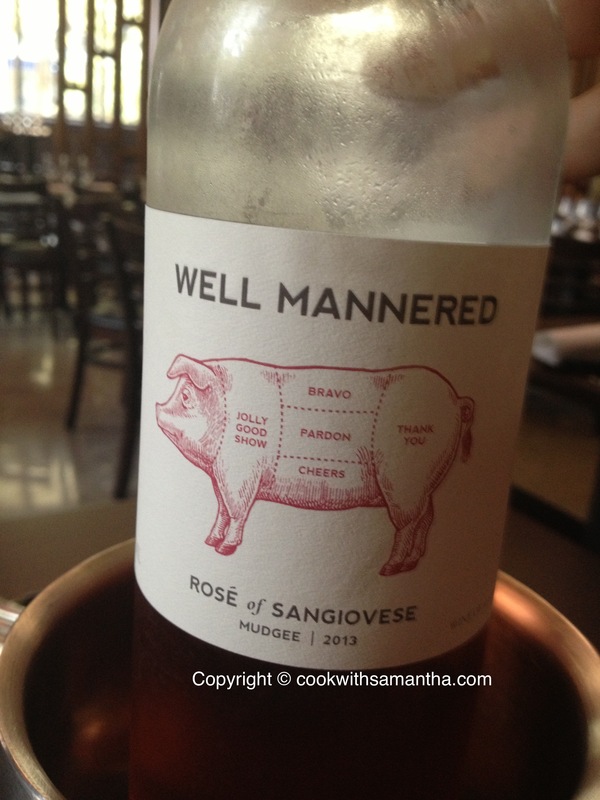 V and I opted for the well-mannered Rose, to the nose you got great smells of strawberries and watermelon. On the palate the wine was delicate and slightly dry, with great berry notes and a hint of melon. Delicious to say the least! 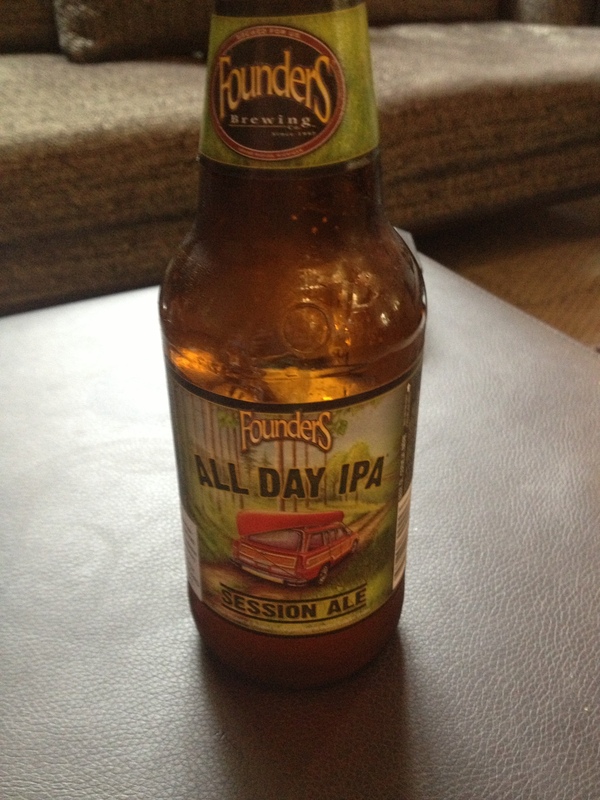 B went for a Founders Brewing All Day IPA which was really fruity smelling and tasting. He enjoyed it but was only allowed one as driving! We ordered the specials to share as well which were the mushroom aranchini balls and lamb empanadas. Unfortunately, we were starving at this point and I completely forgot to take photos. 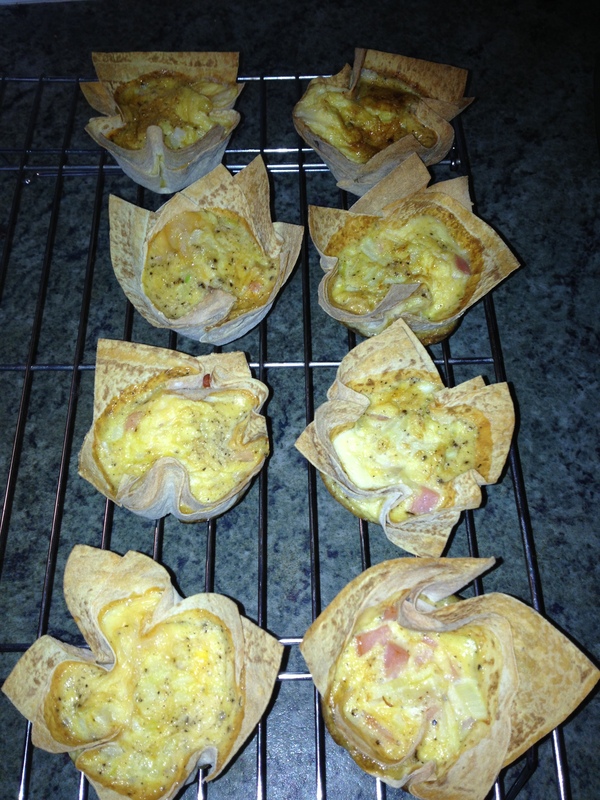 HOWEVER, they were delicious and went down a treat. I highly recommend a trip to Reserve Wine Bar. Don’t expect your bill to be small but do expect to be wowed by the interior, the serve and knowledge everyone had and the table serve to boot. 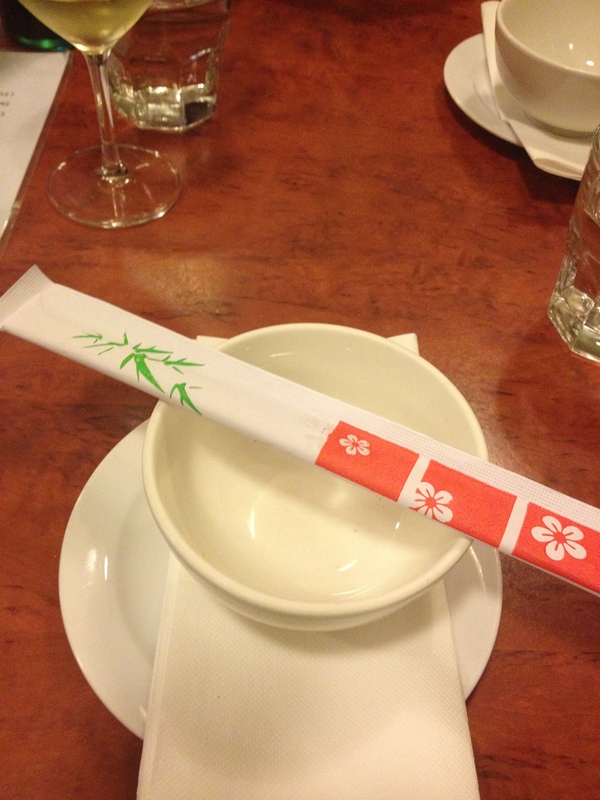 Hubby had gone ahead and booked us a table at Pauls Asian Affair. 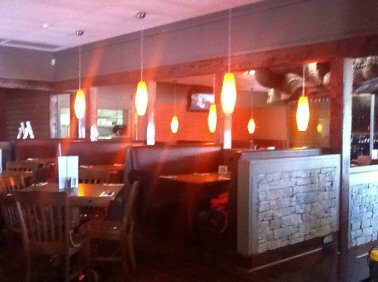 We well renowned restaurant in New Lambton that we had been to a few years ago. We got there and I ordered a Traminer-Riesling. Working in the wine industry I did begrudge paying $28 for a bottle of Rosemount wine when you can buy it for under $10 but this was the cheapest on the menu and the rest were even more absurd! 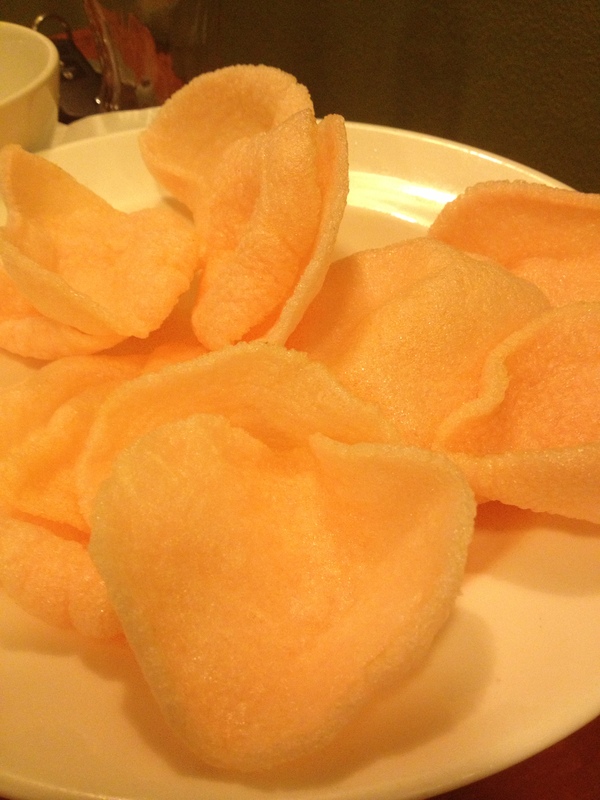 We opted for a prawn toast to start and a nice big bowl of delicious prawn crackers, not overly Thai inspired but still hit the spot! 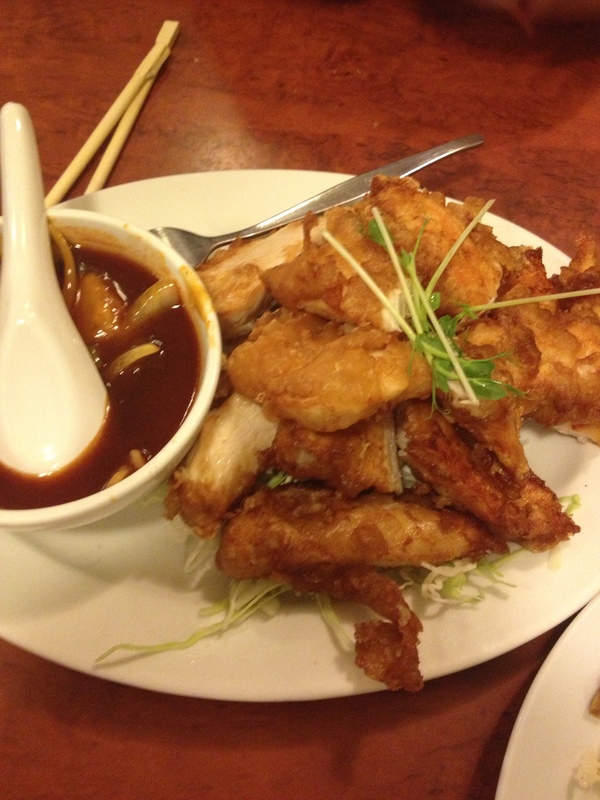 For the mains we opted for a fried rice, crispy fried chicken with a hot sweet and sour sauce and spicy sate pork. We were so full that we didn’t manage to get through half of it but luckily for us we are able to take home both unfinished food and wine! So that was a plus point! 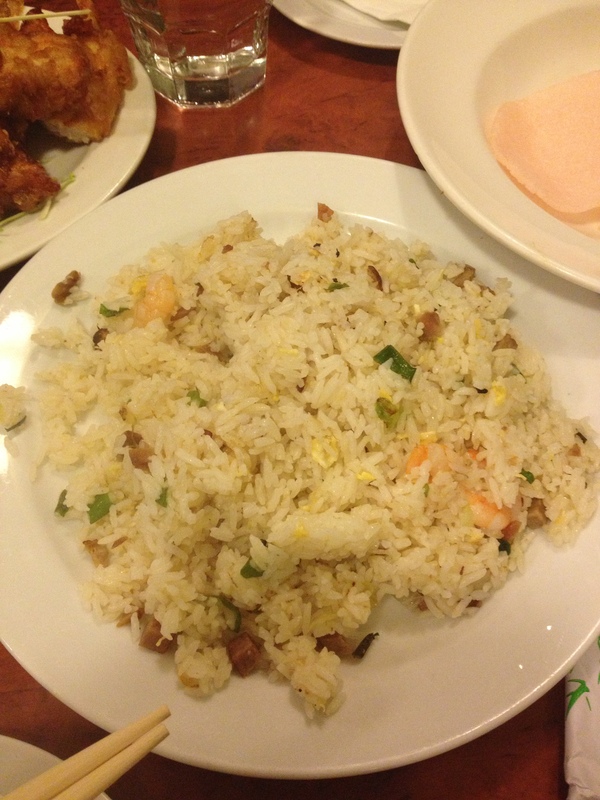 I recommend Pauls Asian Affair for somewhere with great food and fast table service, but don’t go there to enjoy wine. You will just end up bankrupt! Brad and I have beautiful friends. Some we see often and some we don’t but when we do get together it’s like we were never apart. 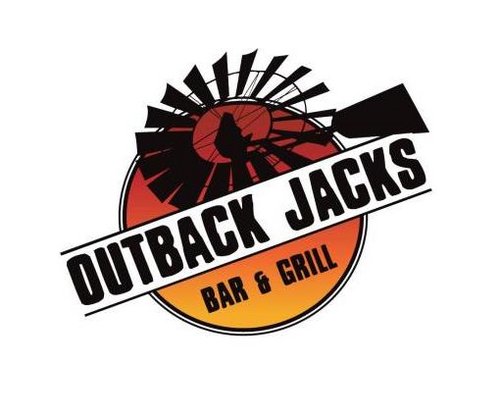 A friend of ours, Jason (who used to work with Brad) applied and got accepted to work FIFO (fly in fly out) and one his last night in Newcastle we were lucky enough to catch up with him, his wife Alyson and his son Joey, for dinner at Outback Jacks. Brad and I went to this establishment for the first time 3 years ago when it was Lone Star. WOW, what a disappointment that was! Brad had been raving about this place for weeks (after finding it at Glendale) and was desperate to get there. 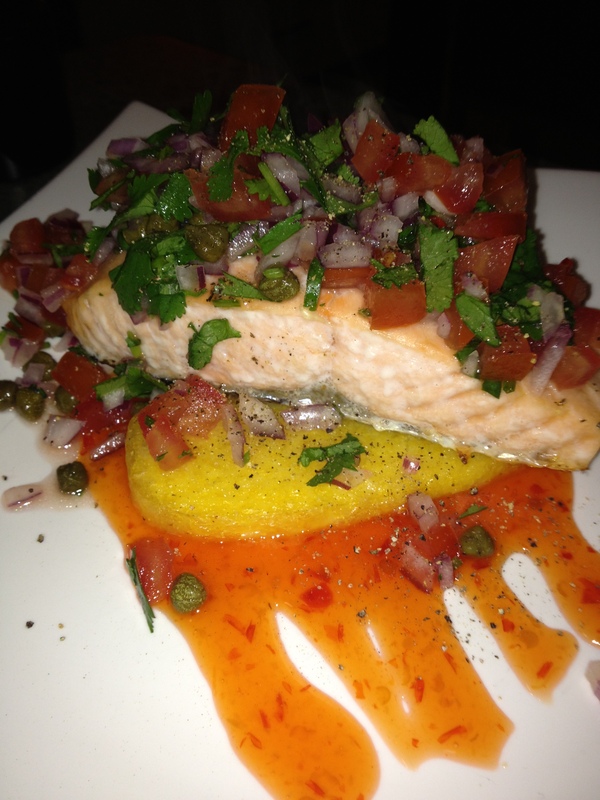 My white wine was warm, our entrées looked like they had been thrown on the plate and our mains failed to even come out. After 1 hour of waiting we were told our “dockets” had been misplaced. Needless to say, we got a full refund back and ended up at McDonald’s! Anyway, Lone Star changed hands and became Outback Jacks. Of course I was dubious when Brad suggested we go there for dinner one night….”it might be better” he said “we need to eat and we are right there” he proclaimed. When we got there then ambiance of the place was completely different, all the waitresses were wearing cowgirl hats and had huge smiles on their faces. We ordered and I’m happy to report the food was amazing! So this is why we went back! We met A, J and J at the restaurant and they had already ordered their drinks, a beer, a cider and a coke. We had a quick look at the menu and progressed to order a house red and a beer also. I have to admit now that I was slightly surprised at paying $8.50 for a glass of house red (only known once I received the bill) but the wine was good, I’ll give it that! We all ordered. 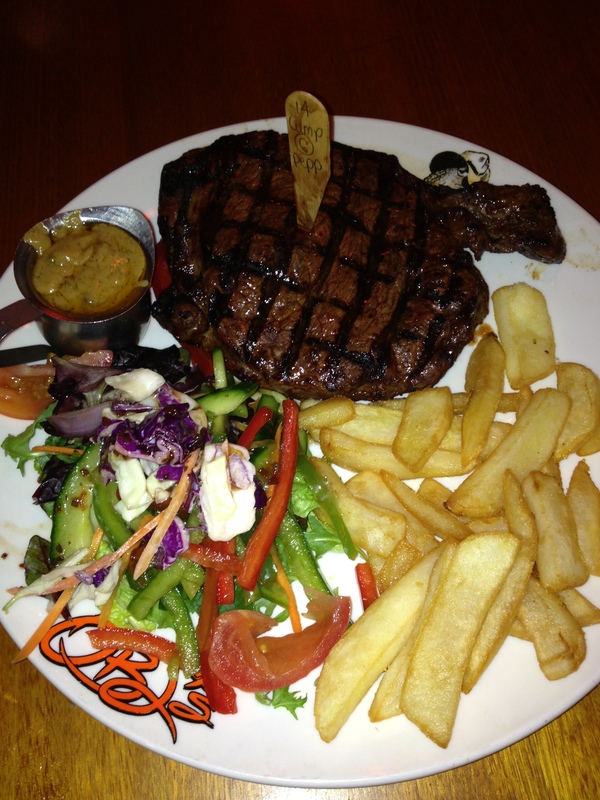 Jason ordered the Lump-a-Rump 500g rump steak with chips and salad. He ordered medium and I advised they cooked the steaks pretty on key so he went medium rare – this bloke has eaten blue with me before! He was super impressed with the way his steak was cut and how it came out. 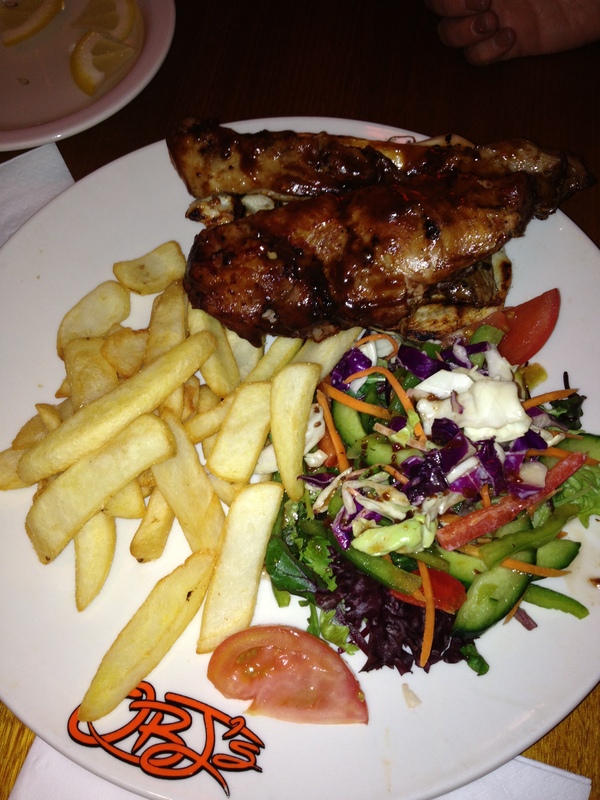 Alyson ordered the chicken and ribs combo and unfortunately was the only dish on that was ordered that failed to come out with the rest of them, we thought it had not been cooked, but eventually it came out and A was very impressed and managed to finish it off! 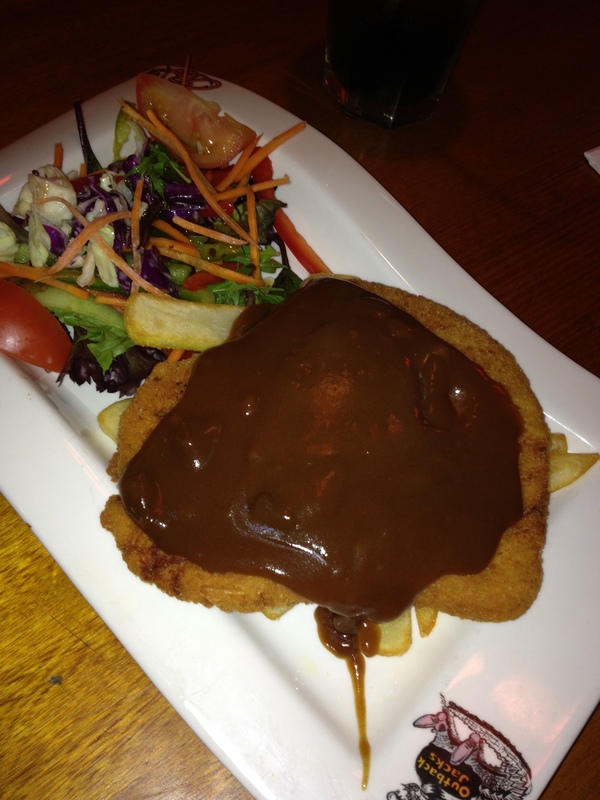 Joey, as teenagers do, ordered the chicken schnitzel and gravy with chips and he was delighted with what was placed in front of him! 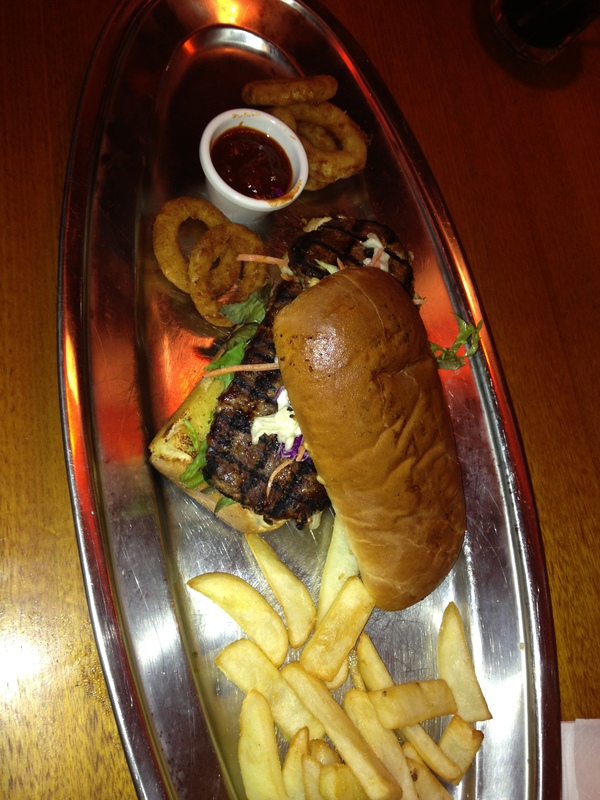 Brad opted for what he had the time before, the Wagyu burger. WOW when it came out on a silver platter it was like dinning with a king! Hilarious but still delicious. I had a bite of Brads burger and normally trying to eat a steak burger doesn’t work for me with an over bite but it was that tender it just pulled apart! 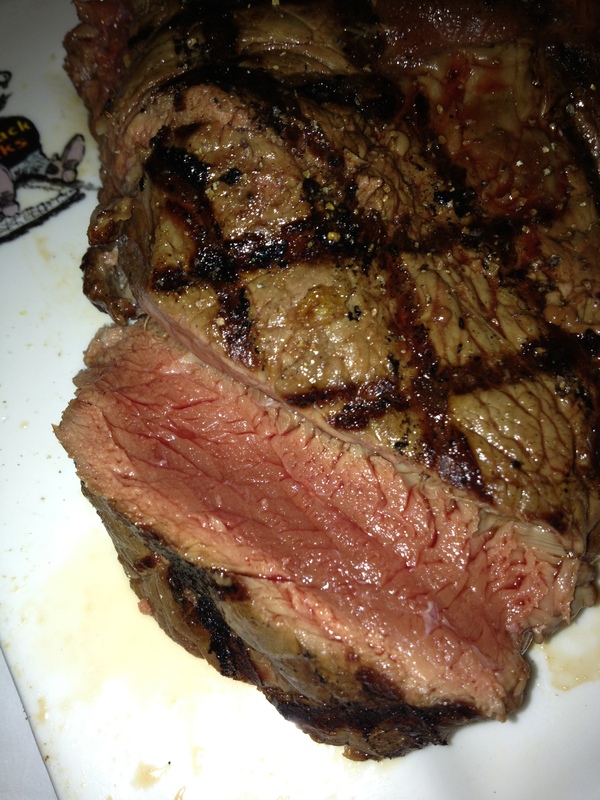 And me, well I opted for the same I had last time, the Sparrows Rump at 300g. OMG it was huge! I ordered blue and pleased I did because I came out rare but I am happy with that. 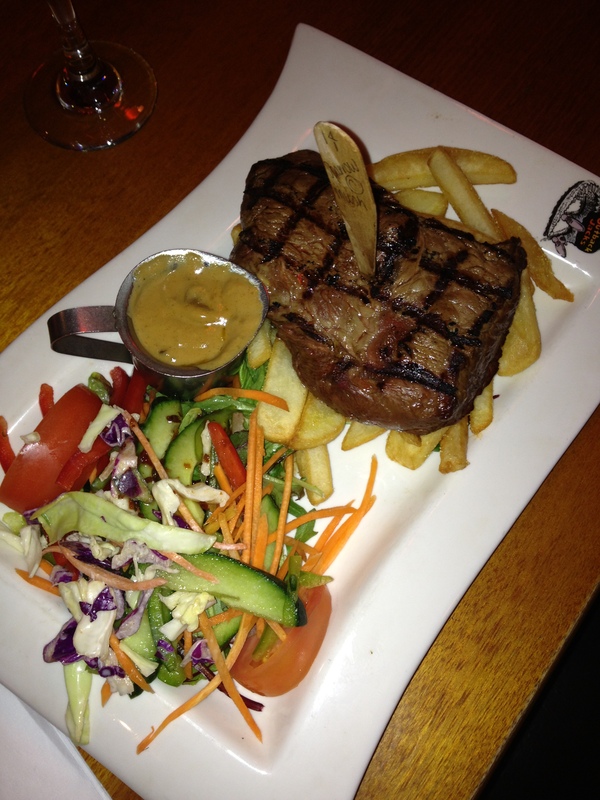 So again, a really successful trip to a franchised joint Outback Jacks! Go there people of Newcastle NSW you will not be disappointed! 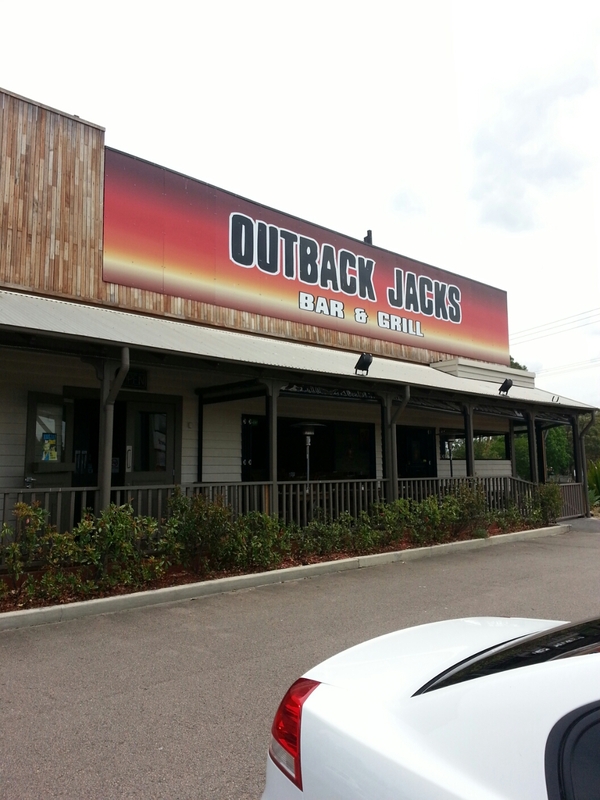 Note: picture of outside and inside of outback jacks taken from google images. OMG I am slightly addicted to this beautiful ground cornmeal substance! It was only a few weeks back when I was chatting with Kate, a girl I work with about polenta. She is gluten intolerant and I tend to cook a lot of dishes that are gluten free as my mother is also intolerant. I was telling her about the ready made stuff I used to use in the UK and how amazing it was. You see, I had attempted to make it from powder form and failed miserably. As I’m sure you’re cottoning onto, I don’t do measurements or timing so well and therefore this make it yourself polenta ended up in the bin. I was super excited two weeks ago when i was just daydreaming down the pasta isle of Coles when I stopped to check a message on my phone and just glanced right and there, low and behold was this ready made polenta! 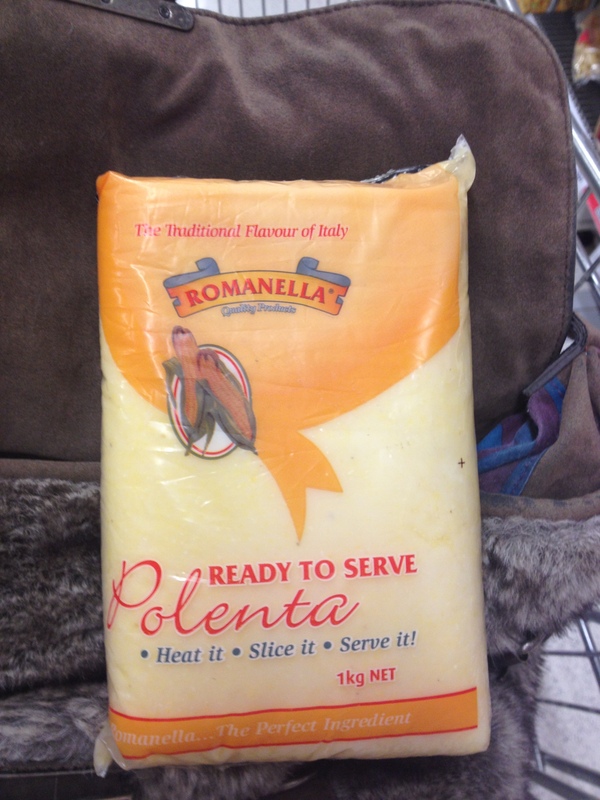 Super excited, I snapped a picture quickly and sent it to Kate, I placed the polenta back on it’s shelf and started walking away, only to find myself dashing back to this exciting find and throwing it into my trolley like a little guilty pleasure! When I got home I popped all my groceries away and then sat and stared at this wonder, wondering what I would make to go with it! You see the ready made stuff, although super easy to use, only as a 3-4 day window from opening the packet and placing it in the fridge. I definitely didn’t want to waste this golden treasure so I started planning meals that I could do that would utilise it all. The first dish I did I pan fried the polenta in thick steaks trying to achieve the rather difficult black line look. 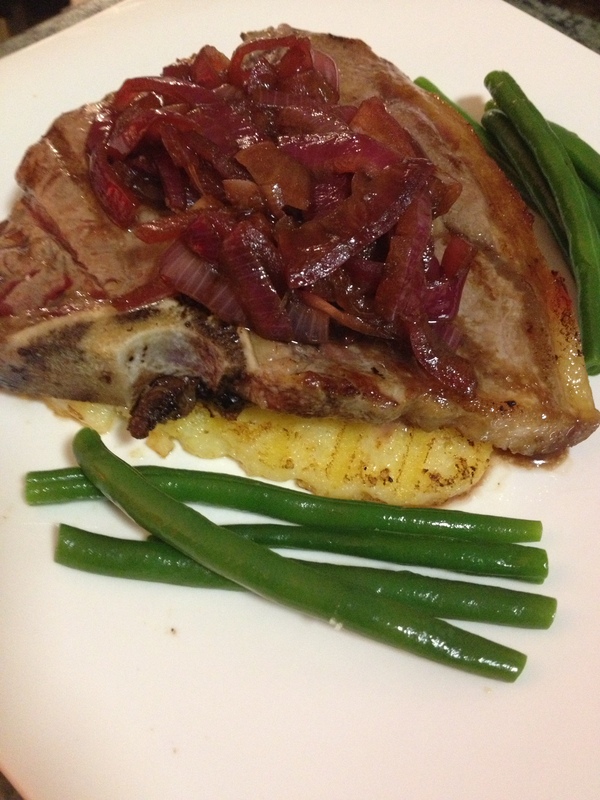 I served this with a T-bone steak, green beans and home made red onion relish. This recipe can be found here. I had enough polenta left over to try a very simple polenta and rosemary fries recipe that I just made up. This time, however, I decided to spray the fries with olive oil and sprinkle salt and finely chopped fresh rosemary and then bake them rather then fry them. Although this took around 30 minutes to achieve, the result was mind blowing and I will post a recipe for this as soon as i make them again and remember to take a picture of it! 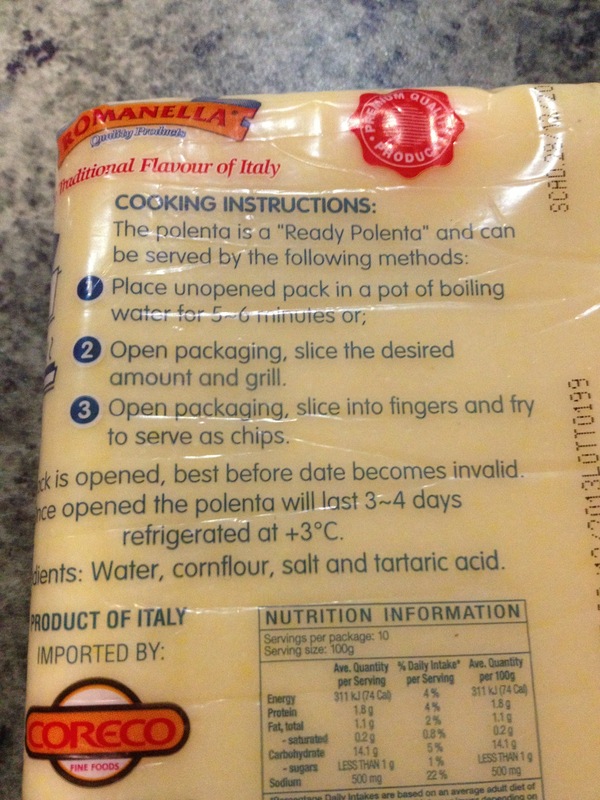 So my journey with polenta is really only starting. Maybe one day I will venture back to the “do it yourself” kind, but for now, I am happy in the knowledge that sat in my pantry (or fridge when I have opened the packet) is my ready made polenta just waiting to be eaten all up! As you are probably aware, I do tend to dominate the kitchen. This is really for a few reasons. 1) I love cooking, 2) I have more patience in the kitchen and 3) I hate washing up and the rule in our house is one person cooks, the other person cleans. This weekend though ended up a bit of a role reversal with hubby taking to the kitchen and making delicious Banana Bread for morning and afternoon teas and his “to die for” Chicken Kievs (this was my recipe which he has now adapted and claimed as his own!) We had his children stay with us this weekend and that is what they requested, so as any dutiful dad will do – he complied! In our family Brad is definitely the baker and I am the cook. I just have no patience in the measuring cup and spoon department and yet hubby just takes his time and writes everything down to perfect it even more the next time he does the recipe! He does tend to make me pretty anxious when he is in the kitchen though, so I do tend to stay as far away as I possibly can! I must take my hat off to Brad though, I think maybe only twice in 5 years of being together has there been a disaster come out of the kitchen, always still edible just maybe not how he expected it to come out and then that makes him cranky. I love my husband to pieces but sometimes his competitive streak gets the better of him! 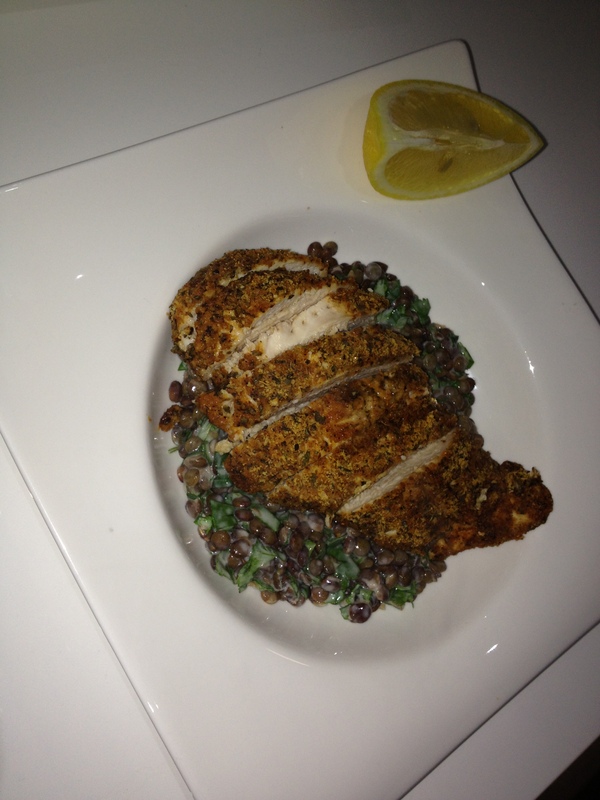 I really hope you enjoy both the Banana Bread recipe and the “to die for” Chicken Kievs. Brad is getting more involved with my blog now, so I’m sure we will see even more yummy things coming from him in the future! 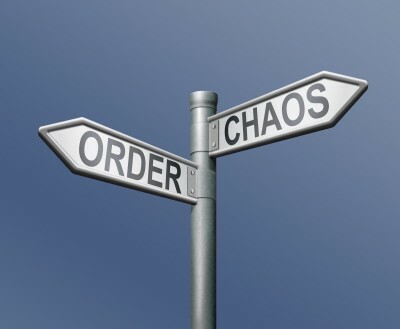 You may think I’m being dramatic, over analysing, or just plain fussy but I kid you not, my expectations when it comes to a restaurant, bar or when eating out is ALWAYS crushed should I visit an establishment more then three times, or order the same dish more then once! 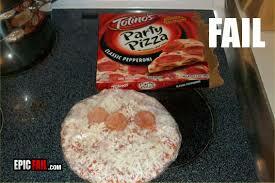 Don’t get me wrong this hasn’t only happened to me when it comes to food. Only 5 weeks ago my world came crushing down around me when a hairdresser, I thought had done an amazing job on my hair 6 weeks previously, proceeded to hack away at my hair and obviously was more focused on me saying I was “thinking” about having it cut off for summer, then remembering that she was “thinning” my hair, not leaving my head practically bald in spots and me devastated. But back to my food conundrum, so last week, on our regular Friday Work Lunch, we decided to head to The Wharf Bar in Honeysuckle, NSW. Secretly inside I was exploding with excitement! The last time we had been there I was attempting a low fat diet and had a grilled chicken burger and no bun. What I secretly longed for though, was the most amazing Reef and Beef pizza with a thick, salty, zesty aioli swirl on top. *dribbles* So on Friday, when I got told this was where we were heading, I knew I didn’t even need to glance at the menu. 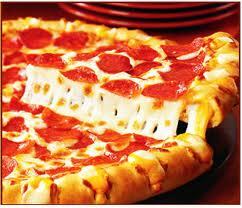 I was having that pizza. I ordered a beer which by all means was lovely and cold. We all ordered our food and I sat back in anticipation for this beautiful reef and beef pizza (another way of saying Surf and Turf) We were being updated by Kate and Victoria about their separate journeys into buying houses when our food was finally delivered. Talk about crushed expectations. Although I did not take a photo of my disappointing, flavour lacking pizza, I’m sure the below pictures can relay my disappointment. The first picture portrays the most amazing, flavour filled pizza, carefully constructed to be able to attack each and every taste bud I own, and the second pizza is that pure stingy felt, heart lacking, non-picturesque pizza that was actually delivered. Why is it that you can go and try a new cafe, bar, restaurant out and have THE most amazing experience there and then you get all geared up to go back only to be disappointed with the lack of service, the quality of food or just the general place itself? Above has been a long running trend for my husband and I. When I knew my mum was coming to visit from the UK, we searched for the best breakfast place in town that would offer the most extensive Gluten and Dairy free options around. We did and we went there three times before my mum eventually got to us, only to take her there and wait for over 50 minutes to get our breakfasts! Disaster, one because I was embarrassed at how much I had “bigged” this restaurant up and two because I turn nasty when I’m hungry and especially hungover! Even friends of ours, Daisy and Christian, had raved about a local breakfast place that was close to us and that we had to try out. Again, the service was atrocious and my sweetcorn fritters with a side of Smoked Salmon came out (very late) as a soggy pancake and a pile of smoked salmon. (not complaining about the amount of smoked salmon, but it was evidently apparent that the amount of salmon on the plate was the reason they could charge $18 for this mess). Our poor friends were mortified. We have however discussed this further and are aware they have usually gone there for brunch and we were there in peak 9.30am breakfast time. But still it’s that crushed expectation when you have in your mind how amazing this experience should be. Am I the only unlucky one who has been unfortunate enough to experience this? Is there a particular reason why this happens? Are your expectations raised after the first amazing visit and therefore you are your own worst enemy? But aren’t expectations there fore a reason, should you not strive to reach perfect of culinary expertise, or enjoy a comfortable clean environment or in fact not walk away from a salon with half your head of hair missing? Will i ever learn? Have you ever felt like a right prat when someone has had to correct you in your pronunciation or use of word?! Well I have on numerous occasions and on Monday it was no different. In fact it was the radio presenters fault for pronouncing this particular word wrong, I heard him say it, I knew it was wrong and yet something inside me proceeded to tell my colleagues, Victoria and Kate, that I too had a packet of Qwin-oh-ah at home that i was going to attempt to cook with. 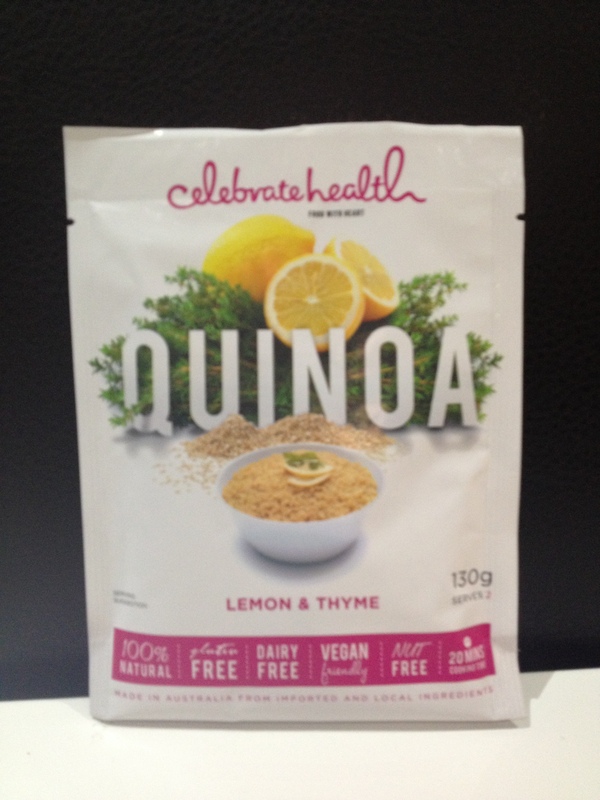 Now of course all you clued up foodie/hip people out there know that the actual pronunciation of this Quinoa is Keen-Wah! WTF!? Qwin-oh-ah is a much better phonetic way of saying this grains name!! I found out yesterday that this grain/seed has been the staple food for Peru and other such countries but because of the increasing popularity among “celebrity chefs” the demand on this super food has increased that much that the staple food that once was, is no longer. Now, this did make me feel a little bad about buying a packet of $3 pre-flavoured quinoa from the shops – well, that was until I ate it. OMG delicious! This is going to become a staple food for my husband an I, however, I will just be buying the unflavoured bags in the future as this one was WAY too salty! Quinoa was important to the diet of pre-Columbian Andean civilizations. Today, people appreciate quinoa for its nutritional value. Quinoa has been called a superfood. Protein content is very high for a cereal/pseudo-cereal (14% by mass), yet not as high as most beans and legumes. Quinoa’s protein content per 100 calories is higher than brown rice, potatoes, barley and millet, but is less than wild rice and oats. 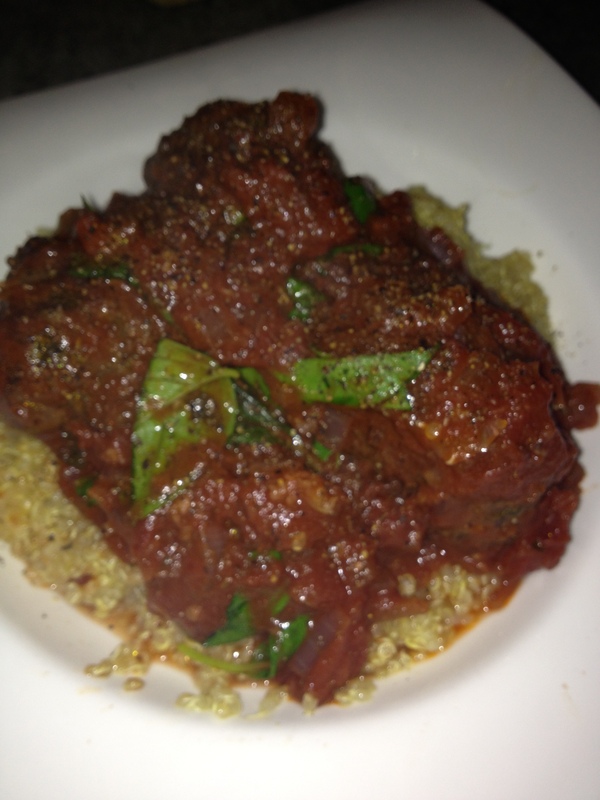 Nutritional evaluations of quinoa indicate that it is a source of complete protein. Furthermore, it is a good source of dietary fiber and phosphorus and is high in magnesium and iron. 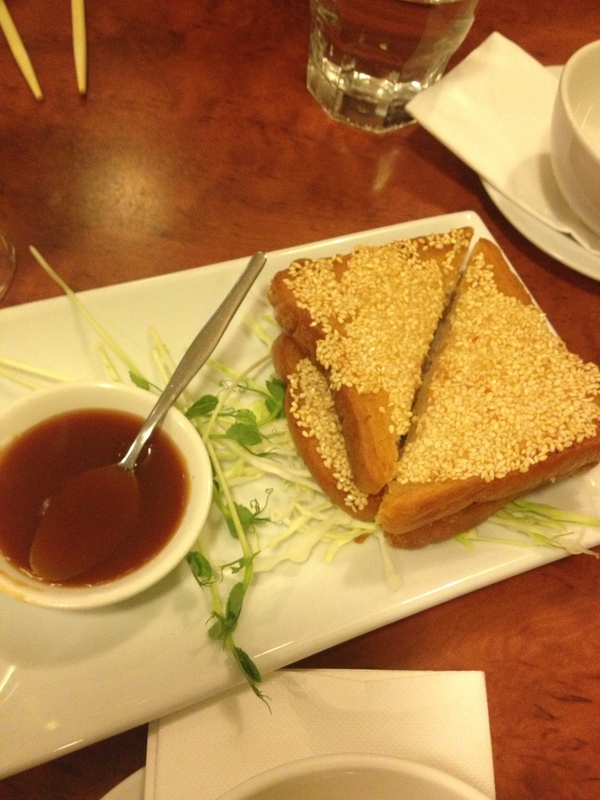 Quinoa is also a source of calcium, and thus is useful for vegans and those who are lactose intolerant. Quinoa is gluten-free and considered easy to digest. Because of all these characteristics, quinoa is being considered a possible crop in NASA’s Controlled Ecological Life Support System for long-duration human occupied spaceflights.Quinoa may be germinated in its raw form to boost its nutritional value. Germination activates its natural enzymes and multiplies its vitamin content. In fact, quinoa has a notably short germination period: Only 2–4 hours resting in a glass of clean water is enough to make it sprout and release gases, as opposed to, e.g., 12 hours with wheat. This process, besides its nutritional enhancements, softens the seeds, making them suitable to be added to salads and other cold foods. Another great positive for this “super food” is that it is actually delicious and Gluten Free! Now there is not much out there on the market that is good for you and delicious at the same time, ESPECIALLY being gluten free!!! I started browsing the search engines for more information on this super seed, I wanted to know recipes, could I get it all year round? I was consumed with finding the right way to cook the small round seed. Then is dawned on me…….just put your own twist on this!! So that’s what I did. I marinated two large de boned chicken thighs in lemon juice, oil and fresh thyme for about 30-50 minutes (the chicken started turning white), i roasted my favourite veggies and cooked up this Quinoa for the first time ever. 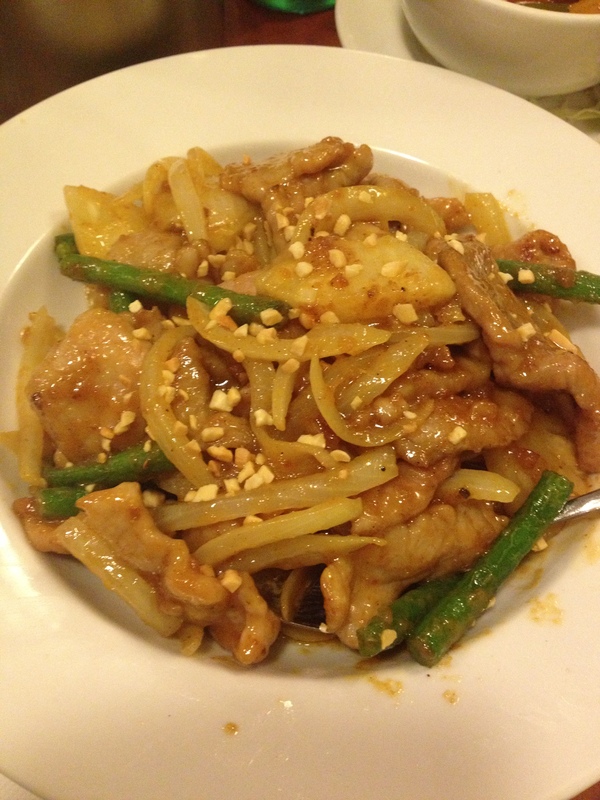 You can find the very straight forward yet amazingly awesome recipe under Chicken. Thank you world for allowing us to par take in eating this beautiful and delicate seed that is not only going to enrich my life health wise, but has opened up more doors for my cooking adventures to follow!